We were off horseback riding at Canyon Creek Ranch just north of Phoenix one day. After the ride, we realized we had worked up quite a bit of hunger and the word “pie” was mentioned. I’m a real pie fan, bypassing cake on my birthday, so I joined the group. Some wanted a traditional lunch but in the back of my mind I remembered the rave reviews of the pie at Rock Springs Cafe not far from the ranch. 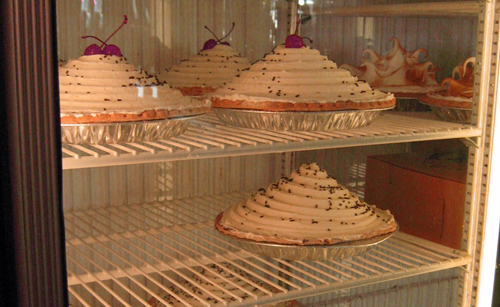 While you can purchase whole pies at Rock Springs Cafe, that day we each selected just a piece from the extensive menu. There were creme pies and fruit pies and, of course, my favorite… berry pie. I also found out that they Have a Hogs in Heat Bar-b-que and Nut Fry the first Saturday of the Month with live music. Sounds fun! Rock Springs has a long and colorful history as an Indian encampment, stage stop and watering hole for miners, drovers and sheepherders. The area around the cafe has grown over the years. There are little shops now. Stop at one of the specialty shops on the property such as the Farmer’s Market, Hoosier Daddy, Herb Shop and House of Gold and Silver. 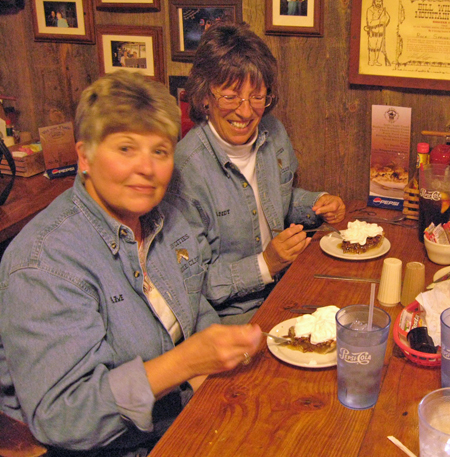 Buying Pies – Rock Springs Cafe sells 45,000 pies a year! You can call ahead to reserve your pie.